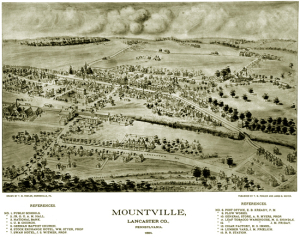 On January 11, 1814, Issac Rohrer laid out the town that became known as Mountville, dividing it into 130 building lots, sold by lottery. Located four miles east of Columbia in West Hempfield Township on the Lancaster and Susquehanna Turnpike, Mountville was originally named Mount Pleasant because it was situated on an elevation affording a pleasant view of the surrounding countryside in every direction. 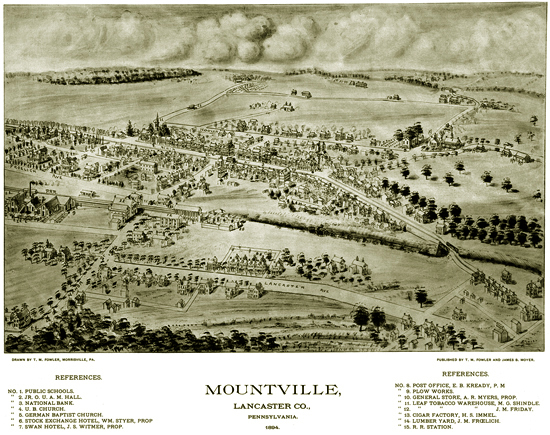 By 1837, when the Philadelphia and Columbia Railroad established the town as a station stop, the name of “Mount Pleasant” was changed to “Mountville” to avoid confusion with another Mount Pleasant located in the southern part of the county. Recognizing the need for a municipal water system, the town incorporated as a borough in 1906. After several annexations of land adjoining the borough through the years since, Mountville now consists of just under one square mile of residential, commercial, industrial and public property. Mountville also boasts one of the highest ratios of public park space per capita. With slightly more than 2,800 residents, the borough is efficiently served by the West Hempfield Township Police Department, amply protected by the Mountville Volunteer Fire Company, and diligently educated by the Hempfield School District.